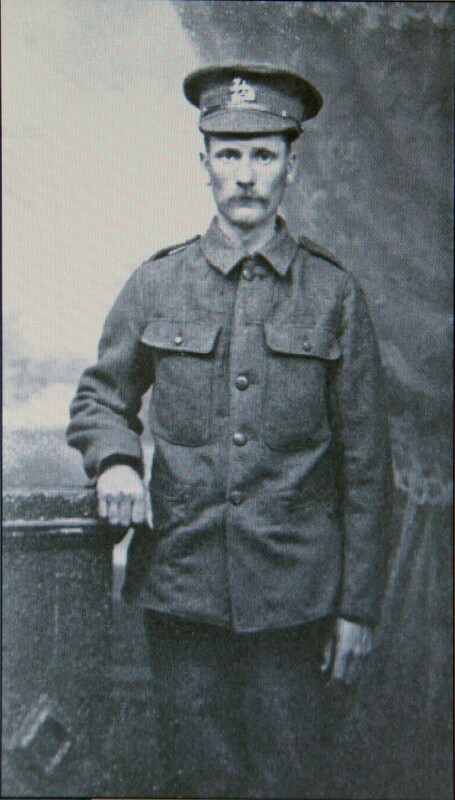 Private 18100 George Smart, 8th Battalion, Royal Berkshire Regiment. George was born on 2 February 1886 the son of Frederick Smart and his wife Jane (née French). He was one of eleven children born to his parents between 1878 and 1899, however, as starkly recorded in their 1911 census entry the couple had only five children still living at that time - six having died. Perhaps even sadder is that all of the deceased children lived for some months, one for almost eight years. The death of a new-born was commonplace, but the chance of survival increased rapidly as the child aged. For one couple to lose so many after the critical first few weeks was a cruel fate. The survivors (as of 1911) were: Annie Maria (born 1878), William (1884), George (1896), Charles (1893) and Edith Mary (1899). The lost children were: Alice Maud (1880-1880), Frederick James (1881-1883), Emily (1888-1890), Ernest Alfred (1890-1891), Alice Lousia (1897-1898) and Frederick Stephen (1892-1899). Frederick, originally from Marlborough, was employed by the Newbury Borough Council; his job description changed from census to census, from scavenger through corporation navvy to roadman. Today the word scavenger conjures upa very different picture from the perfectly respectable role of scavenger in times past. Scavengers date back to the middle ages when towns resolved (or attempted to resolve) problems with waste by leasing out to the highest bidder the scavenging rights for a particular street or area. The scavenger would remove all rubbish from the streets, most of which was recycled (to an extent unheard of today) and consequently had value - so the scavenger would pay the council for the privilege of collecting it. By the 1890s this role was clearly morphing into a council refuse collection system and evidently involved Frederick. The family lived in Clare Place (7 & 10) and then 5 New Square, which were in interconnected alleys off the eastern side of Bartholomew Street. George was educated in local schools, notably St Nicolas Church of England School in Enborne Road, which he attended from 1895 to 1899. This was the best available secondary education (age 9 to 13) for those who could not attend a fee paying school. Prior to this he attended West Street infant’s school. The newly-weds set up home in Herborough Place, another alley of cottages off the east side of Bartholomew Street behind Herborough House (which was also home to Rose’ parents). The site is now part of the footprint of the Kennet Centre multi-storey car park. 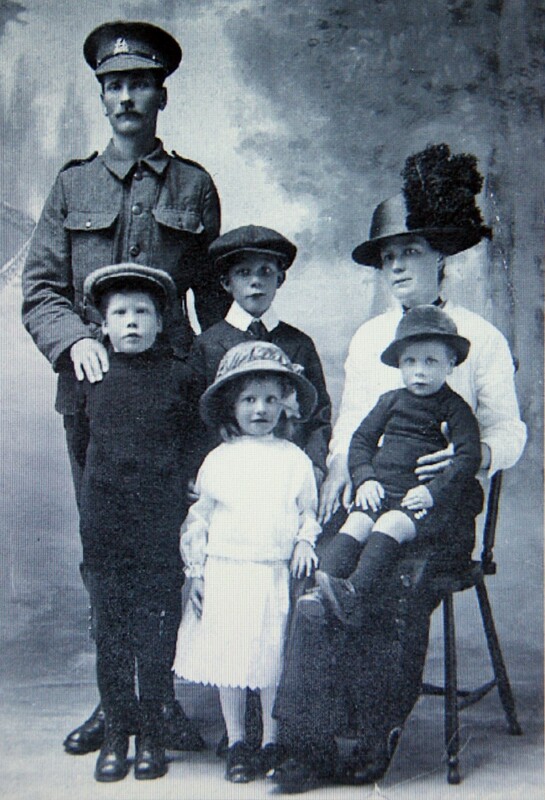 George and Rose had four children: Frederick George (born 1906), William Albert H (1908), Gladys D (1901) and Harold S (1912). George worked for Ravenor & Son a Speenhamland based plumbing, decorating and house maintenance business. The proprietor, Richard Ravenor, a well known town figure (an Alderman and former Mayor), had several sons – though only one joined him in the business; three of the others, Richard, Herbert and Geoffrey died in the war and are commemorated on the Newbury memorial alongside George. He was also a member of the local Rechabite Tent – a biblical reference to Jehonabab leader of the Rechabite tribe who forbade his descendents to drink wine or live in cities. The Rechabites were a Friendly Society and a part of the wider temperance movement, their branches were often named tents. They were particularly strong in Newbury in this period. George also attended the Newbury Congregational Church – nonconformists were usually more inclined to temperance than Anglicans. When war was declared in August 1914 George was not among the early rush to enlist – as a family man no one could criticise a reluctance to risk life and limb when he had a young family to support. However, he could not resist the lure of the uniform for long; he enlisted into the local infantry, the Royal Berkshire Regiment, in May 1915. It is likely that he was posted to their 9th Battalion which had recently been designated as a Reserve (in essence a training) battalion. After a remarkably short time in training he crossed to France to join the regiment’s 8th Battalion on 30 September 1915. His new battalion, which was a part of the 1st Brigade, 1st Division, had been mauled in the opening assault of the Battle of Loos on 25 September and was in great need of reinforcements. Two drafts of men from the 9th Battalion joined them on 5 and 10 October, George was probably among them. Several letters have been received from men on active service who were recipients of the parcels sent out by the Newbury Congregational Church: . . . Pte Smart sends very many thanks. They have had lots of rain, he says, but he adds, “It ain’t no good to be downhearted.” He doesn’t see why Newbury single men should hang back as so many have done. . . . The battalion remained on the Loos front until July 1916 when the 1st Division was transferred south to join 4th Army and the Battle of the Somme. By the time the Division had arrived the first two main phases of the battle had taken place, the most recent being the Battle of Bazentin Ridge. In preparation for another major assault on the German second line defences a number of smaller attacks took place to improve the British line and gain advantageous positions for the forthcoming battle. The 1st Division became involved in the fight for High Wood - the 8th Berks moved forward on 14 August to take up positions as Brigade Reserve in Mametz Wood. On 18 August it took part in an attack on a German position known as the Intermediate Line to the west of High Wood before returning to reserve positions in Mametz Wood on 20 August. 6pm Capt H R Fenner (Lewis Machine Gun Officer) was wounded during intense bombardment of Mametz Wood. Typically the diary fails to mention the effect of the bombardment on the other ranks. However, it was to be fatal for George Smart. He was killed that day when a shell burst close to him – his body was never recovered. SMART – Aug 27, killed by shell fire. Pte G Smart, Royal Berks Regiment, No 18,100, of 4, Herborough-place, Bartholomew-street, Newbury, and second son of Frederick Smart, New-square, Newbury. Mrs Smart, of 4 Herborough-place, Newbury, has received the distressing news that her husband, Pte George Smart, No 18100, of the Royal Berks Regt, was killed by shell-fire on August 27th. He was attached to a Trench Mortar Battery, and had been at Front for twelve months, with a home leave a short time since. His captain, writing to the widow, states that her husband was a most efficient soldier, and greatly liked by his comrades. He was a member of the local Rechabite Tent, and previous to going on service, was employed by Messrs Ravenor and Son. It is particularly sad to know that four young children are left fatherless. Deceased was second son of Frederick Smart of New-square, who has two other sons who have been wounded and are under treatment in English hospitals. 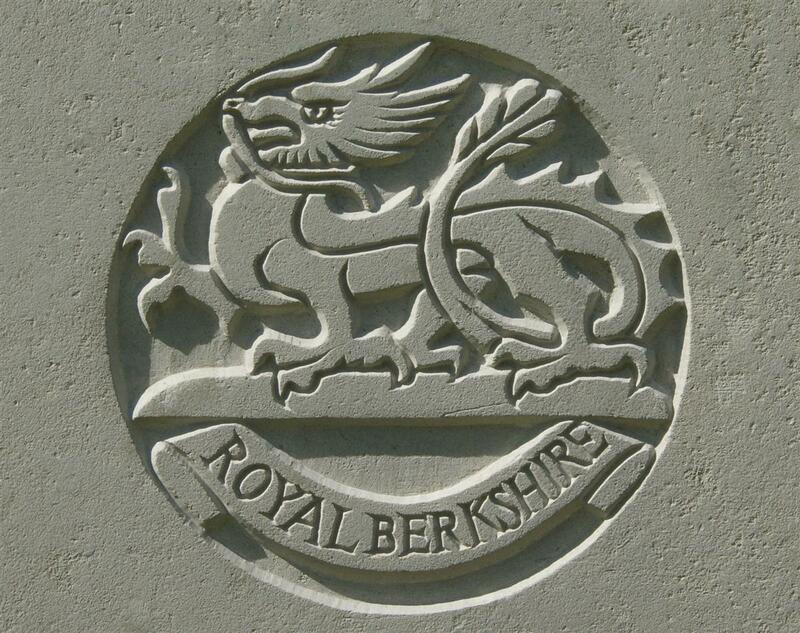 In ever loving memory of Pte G Smart, Royal Berks, who was killed in action in France, August 27th, 1916, the dearly beloved husband of Mrs Smart, 4, Herborough Place, Bartholomew-street, Newbury. Before the fight was won. In ever loving memory of Pte George Smart of the Royal Berks, killed in action somewhere in France, August 27th, 1916, aged 30 years, the dearly beloved husband of Rose Smart of 4. Herborough Place, Bartholomew-street. For dearly we loved him, and will to the end. From his sorrowing Wife and four little children. 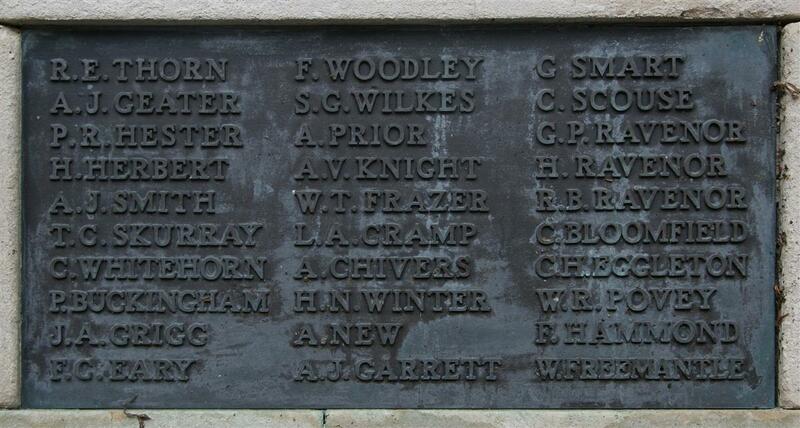 As his body has never been identified George’s name is commemorated on the gigantic memorial to the missing of the Somme at Thiepval (panel and pier 11D). Locally he is remembered on Tablet 12 of the Newbury Town War Memorial and on the parish memorial board and roll of honour in St Nicolas’ Church, Newbury. He is also one of the names on the Newbury Congregational Church Memorial, now in the Town Hall. George's brother William also joined the Royal Berkshire Regiment and served in France with the 6th Battalion. He was wounded during the successful attack on Montauban on 1 July 1916 and subsequently discharged from the regiment as unfit for further service at the front. However, his wounds were evidently not too disabling and, on 11 August 1917, he was transferred to the Labour Corps, spending a further twenty months in uniform before his eventual discharge on 23 April 1919. Sadly it has not been possible to identify Charles among the many Charles Smarts who served during the Great War. He does not appear to have served in the Royal Berkshire Regiment, but there were many other regiments and corps as well as the navy. What is clear is that he was wounded and was receiving treatment at the time of George’s death. It would be easy to jump to the conclusion that, like William and George, he was injured during the Battle of the Somme, as so many were – but he could equally well have been wounded at Jutland or in Mesopotamia. As his name does not appear on the Newbury war memorial he seems to have survived the war, hopefully to live long and prosper.